I fit differently into the world now. It just seems to have happened without me realising. It is the most wonderful feeling yet also it had become so ordinary I had begun almost to take it for granted. It feels so right. What does seem to have changed is how I feel the world perceives me. I thankfully am also beginning to see the world through different eyes now. Recently those eyes have been temporally blurred by depression caused by heartache. Even if the emotions feel extreme they are in glorious colour. Nothings drab anymore. You also get to appreciate the simple pleasures in life. I have still been struggling with my broken heart recently & feeling rather melancholy. My self esteem had taken a bit of a battering. Sometimes a woman has to pick herself up. Put on a happy face & be ready for new experiences, ready for change. Special thanks go to two friends who have recently helped rebuild my shattered confidence. I went back over recent events looking for positives & began to see just how improved my life had actually become. My glass has actually been a lot more than half full even during times I had actually felt rather blue. When I had reversed my parent’s new car into a pillar at the hospital I became upset & emotional. There was a big dent, scratches & yellow paint from the pillar all over the rear wing but it was not the materialistic damage I was really worried about. I had been very worried about my Mums reaction especially her health but she was fine. The nurses I worked with did what nurses do & were absolute Angels to me, when I went into shock & burst into tears. Their comforting words & a sugary cup of tea saved the day. My Mum & Dad were only concerned for my health not their new car when I told them what I had done. When I took the car back to the dealership to assess the damage I needlessly thought I may have the mickey taken out of me by the manager who had sold it to us. He was a real blokey bloke kind of a guy. Our interaction was so different to how it would have been in my previous existence. He had a real rugged physical presence & was very attractive. When I had previously been out for a test drive before we bought the car, one of the other car salesman had made some cheeky chauvinistic comments about my lack of driving abilities when I parked. What I received from the manager was kindness personified. He was a real gentleman. Mum & I were asked to sit down in reception & he said he would take the car away & see what he could do. Fifteen minutes later he came back with all the paintwork cleaned & repaired the dents were barely visible. He did not even charge us. We exchanged hugs before leaving. Mum & I were stunned we thought it would have cost a fortune. We were so grateful we went off to buy a gift for his new born child, a nice cuddly toy, as a thank you. When I went back to work the following week the nursing & admin staff were even more supportive of me. I really felt part of the team but more than that I felt at ease with who they accepted me to be. My parents, the car salesman & the hospital staff had all treated me as a woman. At least that's what it felt like to me. Perhaps I will never really know?What I do know is all the time I was just me. The male mask I had for so long felt forced to have to carry was a very very distant memory. This posting is deliberately sugar coated as I am trying deliberately to look from a different perspective at recent events which made me feel blue. The real world may not always be this sweet. When I think of my recent set backs which have knocked me sideways they pale into insignificance compared with those many friends face on this journey. Later in the week Mum & I had belatedly gone out to get my Birthday present. I had been too sad to get anything beforehand. In the first shop we went in a pretty salmon coloured jacket in my favourite Per Una section of the shop was calling me from a good 50 yards away. It fitted perfectly but we had to be sure. Mum & I had the terrible task of going round at least half a dozen more shops, trying different styles, matching shoes etc. Mum found a lipstick she liked but they only appeared to have the tester left. While she walked away disconsolately I was able to get help from a sales girl & together we discussed lipsticks. Eventually she took down a display just to find the last one in the shop. Mums face was a picture of pleasure when I handed her the lippy as a gift. I We shared a coffee together to take the weight of our feet & after much discussion we agreed I should go right back to the original shop. That jacket clearly already had my name on it from the first moment I saw it. My visit to the local hospital to see the consultant who had referred me for my GRS went really well. Beforehand I had been really worried my broken heart may get the better of me but again he was great. I had made a big effort after a sleepless night & put on my best summer dress & a big happy smile to impress him. He was lovely. When I phoned home to reassure my parents everything was ok they were so pleased I was still on track for my surgery yet they struggled with the concept of me wearing a dress, bless them. Later that day I took my Mum to the doctors. She was with her GP a long time & I started to worry. My poor Mum had actually opened up to her own GP as to what had been behind her recent anxiety & panic attacks. For the first time in her life at the tender age of over eighty having known since 1996 of my condition she talked at length to her own doctor about her daughter. She told me it felt like a great weight had been lifted for her. It is so hard for my parents who come from a different generation to come to terms with my future but this was a huge breakthrough for her. It is so difficult to take our loved ones on this journey. September brings another big challenge. Mum & I will be travelling to Brighton together next month to see the hospital where I wil be having my GRS. Liz Hills the amazing lead nurse there as if by telepathy sent me a very kind e-mail asking me to get in touch as she knew things could get quite difficult for all of us as the operation approaches. I hope this will help my Mums anxiety in the days ahead but she may not see it that way. I will leave it entirely up to her right down to the day to see if she still wants to go. As I left my home on Sunday I meet up with my neighbours. We had a lovely chat. I have invited them to our annual art exhibition. One was very interested in buying one of my paintings even before it goes on display. Another neighbour recently generously put a delightful Rose bush in a pot to the side of my front door. I came back later to find her Mum kindly watering it & we had another lovely chat. It only seems five minutes ago I had to sneak out of my door when I was going through the very difficult stage of living dual role. Big hugs go to a friend who reads this blog, who is dealing with the very demanding balancing act of living dual role at this time. The stress I feel now is minuscule compared to how I felt in my previous existence when I was perceived as a male just because of my body & a certain birth defect. Life is so different for me now. When I visited my parents this weekend it was a warm sunny day & our doggy wanted to play in the garden. Again it only seems a short while ago when I could not do this simple pleasure. 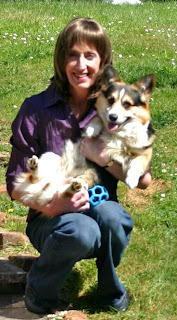 Two years ago I took some photo’s in the garden while my parents were away on holiday, of me as Debbie with our doggy. (see the photo above) I took them to try to reassure them when they were ready to accept my need to transition, I would not look like a drag queen. In those days I could only go so far out into the back garden for fear of my parent’s neighbours seeing me. Now we can play in the garden any where we like. Come & go as we please. Life is being kind to me. It could certainly be a whole lot worse. It is the right journey for me & even if I could turn back now, it is not something that is an option or something which has ever crossed my mind. It helps so much to see the world from a different perspective. It's that good angel looking out for you. So nice to see all these nice things happening! And you have to come solo to Brighton next month, what are your lunchtime plans? Incidentally thanks for your very kind comments on my own postings! It's lovely to read such a chatty post. Things sound more on track again. Like you I would have been very upset about the car - you have a good dealership, they are worth their weight in gold. I hope that now your mum has opened up to her Doctor it will help her feel more at ease. It sounds like you enjoy your shopping trips together. Life is being kind to you, because you are being kind to yourself and the people around you are picking up on that. It's so reasuring to someone who is having a tough time to read something so positive. It really instates hope for me yet.